Andy joined the Youth set-up at Nene Park on 21 July 1997 as a fifteen year old trainee after being released by Luton Town’s youth academy. He impressed during the youth team games and at the age of 17, got his chance to make his debut for the first team in a League Cup tie at Farnborough on 22.December 1998, coming on as a second half substitute, A year later, he had risen through the youth team ranks to becoming an influential first team regular. He proved his versatility during his time at Nene Park, playing in central midfield or on either wing (and did play at left back earlier in his career), adding important flexibility to the squad. He made his league debut for the Diamonds in the 1999/2000 season, and went on to feature in the Conference winning season in 2000/2001, starting in 37 of the games that season. He then helped the team reach the play-off final in the 2001/2002 season, but missed the trip to the Millennium Stadium due to suspension. He then featured for the team that won the Division Three title in 2003, and started in 42 games in Division Two the following season. After more than 200 appearances for the Diamonds, Burgess left on 12 January 2006 and signed for fellow Conference side Oxford United for an undisclosed fee in a deal which also saw John Dempster move to Oxford. After some eighteen months and 50 appearances for the U’s however, he returned to Nene Park on 6 August 2007. Up until the end of the 2007/2008 season, he had scored 25 league goals for the club and made over 250 appearances, taking him into third place in the overall appearances totals for Rushden & Diamonds. A very successful season in 2007/2008 was marked by a number of awards including the Fans “player of the season” award, plus a number of appearances for the England “C” team. 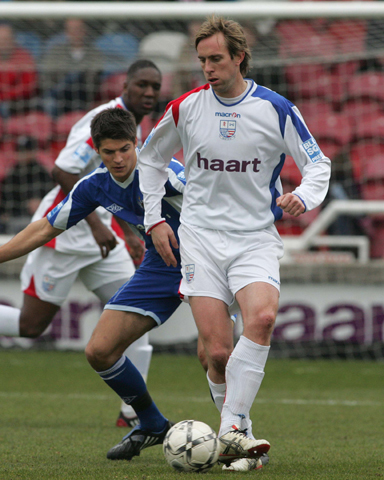 At the start of the 2008/2009 season, he was named as Rushden & Diamonds Club Captain and also assumed the role of team captain following the departure of Curtis Woodhouse. During that season he appeared in 40 league games, with a number of games missed after he sustained a fractured eye socket in an FA Trophy game. After his two year contract at the club expired, he signed for Luton Town in July 2009 – the club he had supported as a young boy. 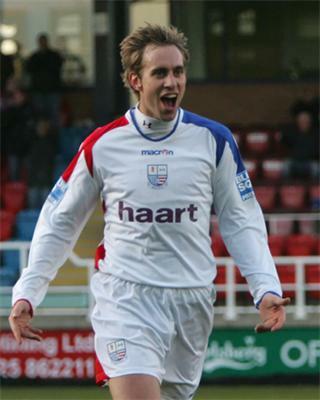 Andy had made 333 appearances for Diamonds, scoring 34 goals during his tenure at Nene Park. Only Garry Butterworth has played more games, while he also made more appearances in the Football League for the club than any other player. After just 8 games for the Hatters however, injury problems and a change of management saw him sign for Mansfield Town on 26 November 2009, on an end-of-season loan deal. Although he was expected to sign a permanent deal, financial restraints meant he was released in the summer. On 21 July 2010, he signed for Northern Premier Division One North side Chester, but struggled with part-time football and left the club in late October. Andy was training with Conference side Fleetwood Town during early November in an effort to regain full fitness, and joined Conference North side Corby Town on 18 November 2010. After being released by Corby in order to reduce the wage bill, he joined Conference North side Droylsden on 18 January 2011, but remained there only 6 weeks. On 8 March 2011, Andy joined Conference South side Woking, and helped them into the end of season play-offs. On 26 May 2011, he returned to Conference North side Corby Town, where he took up the role of player/coach before leaving before the end of the season. On 6 July 2012, he was appointed manager of Leeds United Ladies FC having had previous experience of Women’s Football at Kettering Town, Sheffield Wednesday, Leeds Carnegie, Nottm Forest and Preston North End. After a period away from the playing side, Andy joined NPL Premier side Stamford AFC during mid-July 2013 for their pre-season programme, and secured a deal at the end of the month. He left during November, and joined North West Counties Premier side AFC Liverpool on 24 November 2013. On 1 June 2014, Andy was unveiled as manager of newly promoted North West Counties Division One side Barnton. He left there for a brief while before rejoining as Assistant Manager, but in October 2017 he took up a coaching role with Widnes FC, combining this with working for the Accrington Stanley academy.